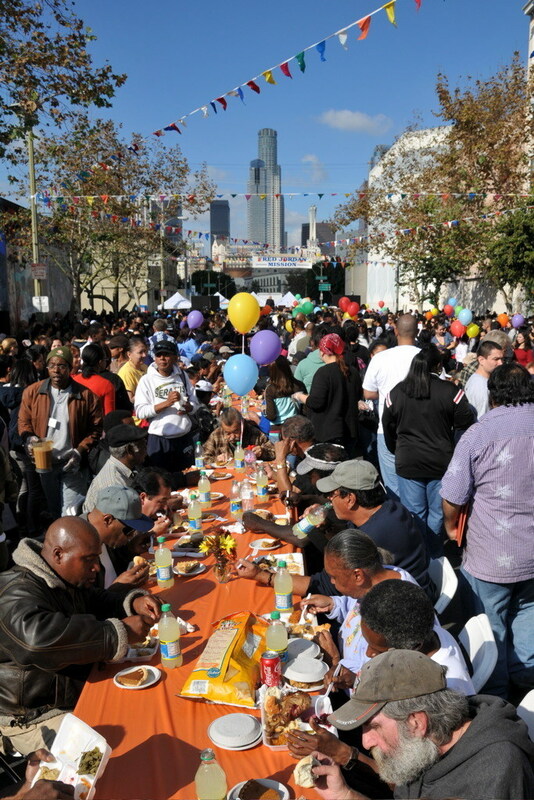 Thousands of Los Angeles' most impoverished men, women and children celebrated Thanksgiving Day at the Fred Jordan Missions' 73rd Annual Street Banquet in downtown Los Angeles. Thanksgiving Day guests include working low-income families, who couldn't afford to cook a holiday dinner, as well as near-homeless families, and homeless men and women who sleep on the streets of downtown Los Angeles. When Fred Jordan founded the Mission in 1944, and realized that holidays on Skid Row were miserable and lonely for the hungry and homeless, he declared that holidays would always be special at the Mission. Everyone was welcome to the Missions' holiday celebration, explained the Mission. Angelenos interested in participating in the next Holiday event at the Mission can bring a $15.00 - $20.00 unwrapped toy to the Mission, on any day before December 16, 2017.